The certification system is extremely important for us not only from the point of view of the image, but above all as a confirmation of the highest quality and safety of our products. PN-EN ISO 9001-2015 is an international standard specifying the requirements to be met by a quality management system in an organization. The ISO 9001-2015 standard implemented by us is aimed for understanding and meeting the Customer's requirements, providing results of process efficiency and their continuous improvement upon the basis of objective measurements. The Directive 2014/34/EU is a certificate supplied by us together with the finished elements, which proves that our products are designed to be used in a potentially explosive atmosphere. Elements covered by the ATEX Directive are also CE marked, which is our declaration that the marked products meet the requirements of the so-called "New Approach" directives of the European Union, i.e. those concerning safety of use, health protection, and environmental protection. Certificate No. 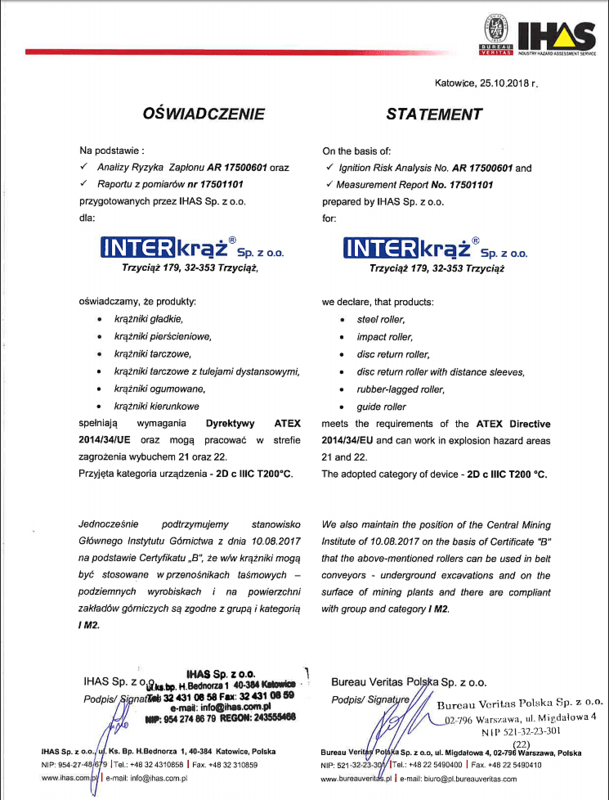 B/2181/III/2017 is a document issued by the Central Mining Institute in Poland, entitling us to mark products with the "B" safety mark. It has been issued in accordance with the product certification programme no. PCDW-01. The Common Guarantee Trademark "B" granted to us proves that our steel rollers Ø 108 are safe to use, modern, environmentally friendly, and also inspire trust among customers. Certificate No. B/2182/III/2017 is a document issued by the Central Mining Institute in Poland, entitling us to mark products with the "B" safety mark. It has been issued in accordance with the product certification programme no. PCDW-01. The Common Guarantee Trademark "B" granted to us proves that our steel rollers Ø 89 are safe to use, modern, environmentally friendly, and also inspire trust among customers. Certificate No. B/2183/III/2017 is a document issued by the Central Mining Institute in Poland, entitling us to mark products with the "B" safety mark. It has been issued in accordance with the product certification programme no. PCDW-01. The Common Guarantee Trademark "B" granted to us proves that our steel rollers Ø 159 are safe to use, modern, environmentally friendly, and also inspire trust among customers. Certificate No. 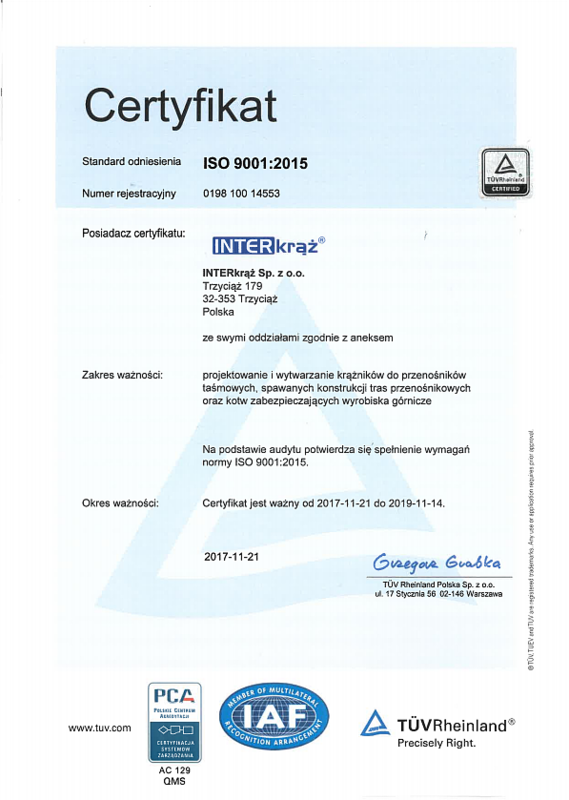 B/2184/III/2017 is a document issued by the Central Mining Institute in Poland, entitling us to mark products with the "B" safety mark. It has been issued in accordance with the product certification programme no. PCDW-01. The Common Guarantee Trademark "B" granted to us proves that our steel rollers Ø 133 are safe to use, modern, environmentally friendly, and also inspire trust among customers. Certificate No. 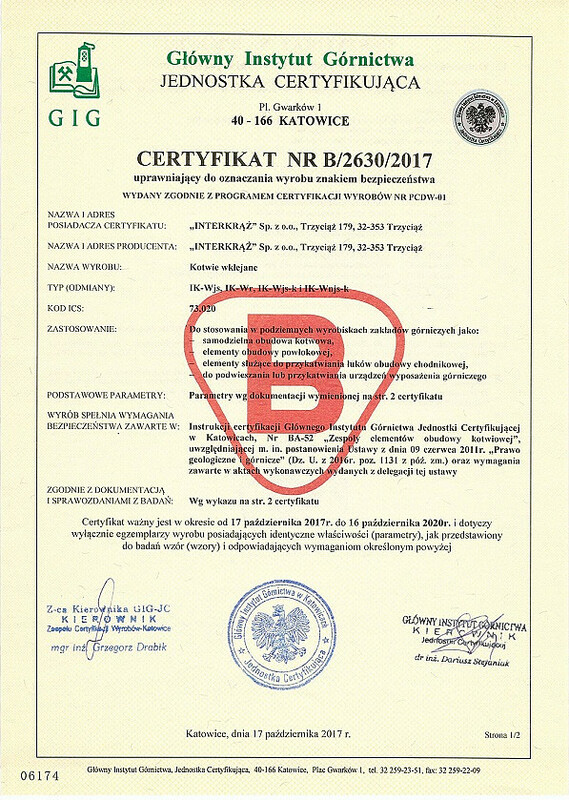 B/2630/2017 is a document issued by the Central Mining Institute in Poland, entitling us to mark products with the "B" safety mark. It has been issued in accordance with the product certification programme no. PCDW-01. The Common Guarantee Trademark "B" granted to us proves that our adhesive roof bolts are safe to use, modern, environmentally friendly, and also inspire trust among customers. Rollers for belt conveyors must meet the requirements of, among others, standards PN - ISO 1537-1997 and PN - M 46606-2010, or equivalent standards. Materials, parts, assembly, and cooperation of our products conform to PN - M 46606-2010, PN ISO 1537, PN - EN 13463-1, PN - EN 13463-5, and international DIN standards.